Pochemuchka (почемучка) – Russian, a person who asks many questions – This blog is not an ofﬁcial Department of State website and does not represent the Fulbright Program or the Department of State. This blog is not an ofﬁcial Department of State website and does not represent the Fulbright Program or the Department of State. I noticed the abbreviation ГОСТ everywhere in the supermarket from the first few days I arrived in Ulyanovsk. That was in September. I’m not proud of how long it’s taken me to Google what that actually stands for, but who cares. We’re here now! So what is ГОСТ and why is it written on all kinds of food packages? ГОСТ is an abbreviation for Государственный стандарт, government standard. I’m sure anyone who’s noticed it written on so many different kinds of products came to this conclusion eventually, but even so, now you know for sure! Aren’t you satisfied? Author SashaPosted on March 26, 2017 Categories UncategorizedLeave a comment on What does ГОСТ mean? I’m from nearly-rural Pennsylvania but I’ve always loved cities. I have a lot of traveling ahead of me, but so far I’ve been to several huge cities along the east and west coast, plus Santiago and, of course, Petersburg. And I love the cities I’ve been to! I love the arts, the public transit that actually exists and actually works (contrary to the grumblings of many of those cities’ locals.) I love the diversity of people, of foods, of languages, of experiences. Cities do not especially frighten me; I think the benefits are worth the increased risks associated with the increased density of humans. And cities do not especially repulse me, even when the summer heat makes them especially taxing, and even when I have to shuffle through their trash and dirty alleys. But I have never come to like New York City, and for a while maintained that I did not like Moscow. New York City is too big, too dirty, and too mean for me. It’s a wonderful place for people who love it and I think the love that people have for NYC is legitimate, especially for those who actually live there. But it’s not my kind of place. For a while, I thought this was true of Moscow, too — but finally, I’ve changed my mind. I like Moscow. A lot. Moscow is clean, or at least so much cleaner than NYC. Instead of being cramped, it’s open: the streets are wider and the buildings are shorter. And it’s old; I’m not going to pretend I know a damn thing about architecture, but I can say that I find that Moscow’s many different kinds of buildings have more character and charm than what I’ve seen in New York. And there’s one thing that makes Moscow special to me in ways that NY never will be: it’s Russian. Moscow is unique enough to impress foreign guests with its Russianness in spite of its massive size, and in spite of how drastically life in the capital differs from that in the provinces. These realizations came gradually over time, but perhaps the thing that really moved me to love Moscow is that I finally made some friends there. They were a sharp, smiling kid from the south looking to make a new life in the capital; and a Chinese undergrad student (of Russian) on her winter holiday. Of “Olya,” the Chinese girl, I don’t have too much to tell, but the Russian boy worked his way into most of my adventures in Moscow (giving me invaluable Russian practice along the way :D). I wanted to upload a bunch of pictures of my travels onto this blog, but my browser gave me an error that it ran out of memory while trying to do it. I don’t know how to get around that and it’ll take me time to figure it out. I spent New Years in Moscow. I planned to go there and elbow my way into Red Square, Russia’s New Years equivalent to Times Square (complete with fireworks and a televised concert.) However, things didn’t go according to plan. Several other Fulbrights had the same idea as I and we congregated in the capital, so I had company. Unfortunately, the rest of the evening didn’t go so nicely for me. The weather was wetter than I had anticipated. I had come from Ulyanovsk, my post, where everything was frozen and seemed content to stay that way until the spring equinox… or maybe later. Not so in Moscow, which meant that my shoes were soon soaked through, something which quickly kills the fun of winter weather. Being outside was hard to bear, even while moving. Considering that I wanted to stand for hours and hours in Red Square, perhaps the next misfortune was also sort of a blessing: Red Square was closed, at least to plebs like me and my Fulbright colleagues, so ultimately, I didn’t have to stand all night in one place on my freezing feet. The entrances to Red Square were swarming with police officers (as was the whole heart of the center) and these armed, black-uniformed men repeated endlessly that the square is closed to all persons except those with a special invitation. I never did figure out who was special enough to get into the square that night, but it doesn’t take much imagination to guess. The rich, the famous, and the powerful — and perhaps a few plebs who got luckier than I? So to cut it short, I did a lot of walking that night. At least the center was beautiful. It’s always beautiful, but it was elaborately decorated for New Years with little holiday markets and lots of gold, silver, and colored lights everywhere you looked. As midnight drew near, most of the group wanted to stay in the bar and meet the new year together around one big table. I wasn’t about that. I decided to go see fireworks at a park I was familiar with (called Sokolniki.) Two girls in the group decided to join me. We stood in line to get into the park (standing in line in Russia, insert joke here) then counted down to midnight with the crowd. We watched a total of 3 fireworks shoot into the sky at midnight and hummed along with the Russian national anthem while all those around us hugged and sang and played with sparklers. The kids were cute. The drunk guys were not yet drunk enough to be scary, so they were fun to watch too. My companions decided to go straight home after the anthem ended, but I stayed and walked in a loop around the park’s center where most of the revelry was going on. What a strange experience it is to be alone on New Years, but surrounded by people. To be surrounded by people, but to be foreign. To be a sober adult surrounded by giddy children and glassy-eyed adults. Walking through the park on Russia’s biggest holiday, I witnessed so many sides of humanity in the span of a 20-minute stroll. There was a lot of joy, but I also found many people who looked as lonely as me. I wondered if their loneliness was more permanent than mine. I saw a drunk girl fall down into a puddle and no one stopped to help her; I hope she got home safely. I saw lots of different kinds of relationships playing out between people of all ages, from kids with their grandmas to young lovers and married old goats. I wondered if the children, running like wild, had any concept of being up way past their bedtimes. When I made it back to my starting point in the park, I saw that a pretty terrible concert was taking place. There was a band with some woman singing off-key and shimmying about on the stage. I decided I’d had enough. I rushed to the metro and made it into what was probably one of the last cars of the night, as the metro always closes at 1am. I got back to my hostel, showered, extricated myself as politely as possible from the other guests (who were much kinder and more sociable than at any hostel I’ve ever stayed in), and crawled to the top bunk of my bed with a sigh. New Years is my absolute favorite holiday, but for most of my life my plans have dissolved into dissatisfaction. But I was safe, and I was in Moscow, and I still had another few days there in the capital to make up for it. And that’s where my next blog post will leave off: what I did in Moscow, and the friends I made there! I have been avoiding my blog, but I have NOT stopped writing 🙂 I weeded a folder of about 300 poems I’ve written and set aside some I might try to publish. I started a separate journal for writing about what’s going on in the world and my place in it. I’ve started roleplaying with my best friend – and for those of you who treat “roleplaying” as if it’s a dirty word, stuff it. Call it “shared story writing” if you prefer. I’ve loved working on all of these projects and even some stories and journals I’ve been writing on the side. But here I am again, updating my no-fun blog. And it’s all for YOU, Gram. My grandma is really cool. She sometimes colors her hair purple and has an impressive history with both dating and motorcycles. Hummingbirds are her spirit animal. Her current occupation is Protector and Spayer/ Neuterer of Stray Cats. If you’re looking for something to read over the holidays, you can download Bulgakov’s Master and Margarita for free as a PDF. Or you can buy a more readable ebook version OR find it in stores — I would be surprised if BAM and big stores like that didn’t stock it. But how can you say no to free?! It’s a shame that Russian literature is so understudied in the US, and it’s something that I have to answer for whenever I meet a new person who’s curious about Americans. What Russian literature do Americans read? If I were to be honest I would answer: Wrong question, friend; most Americans don’t read any of your literature at all. So do your part to defeat the stereotypes about murica-centric U.S.A. and crack open a Russian novel this winter. I’d like to share this more for myself than anything. I’m researching interesting places I’d like to travel in Russia when I have free time in the winter and summer before I go home. Every time I was in Saint Petersburg, I missed out on opportunities to visit monuments dedicated to the poet Anna Akhmatova, who might be my favorite woman ever. Before I look into other historical and cultural points of interest, I felt the need to at least read about one monument in particular, just to put my curiosity to rest. One of Akhmatova’s most famous works, Requiem, concerns the period that she and countless other women spent waiting outside of a prison, waiting to pass food and news to their loved ones being held inside, waiting to learn if they were even alive. Akhmatova lived through extremely dangerous times in the Soviet Union when Stalin’s oppression was at its height. Her first husband was executed and her second husband as well as her son were repeatedly imprisoned, all for political crimes. Akhmatova endured much suffering without complaint. I believe the poems she wrote during these times would move any reader, even those who as stoic as Akhmatova’s own restrained style. 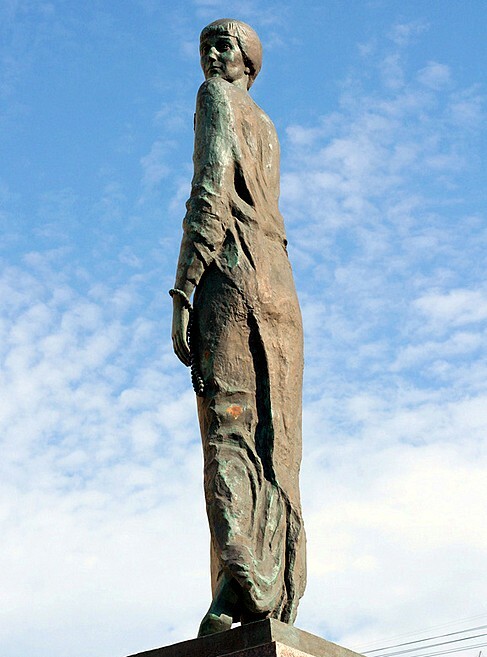 Maybe someday I’ll make it there to see this and other Akhmatova monuments in person. The general attitude toward politics is apathy (plus sort of dark humor.) Votes don’t affect anything, they say in an offhand way. Other conversations on topics ranging from soul mates to gopniki have also led me here. I don’t like fatalism as a worldview. There are some pretty convincing arguments as to why free will doesn’t exist — but that’s not what I’m talking about. People can and do change their lives, hone their skills, overcome their limitations, and even reshape their societies. Acting like the present state of things is unalterable seems ridiculous to me. This is why I was surprised when Putin, in his address to the federal assembly earlier this week, mentioned Russia’s duty to empower all children, with emphasis on all. I’m paraphrasing here (as well as translating), but the gist of what he said is that Russia should assume that every child has the potential for talent and success. Russia’s duty is to help them realize their potential. And wouldn’t you know, the assembly cheered! Continuing my Google images Russian art study: Laktionov!